The interior of this historic Gothic building from the 14th century dates back mainly to the 17th century. Its most valuable element is the organ – an instrument, which has been preserved in its original to this very day. 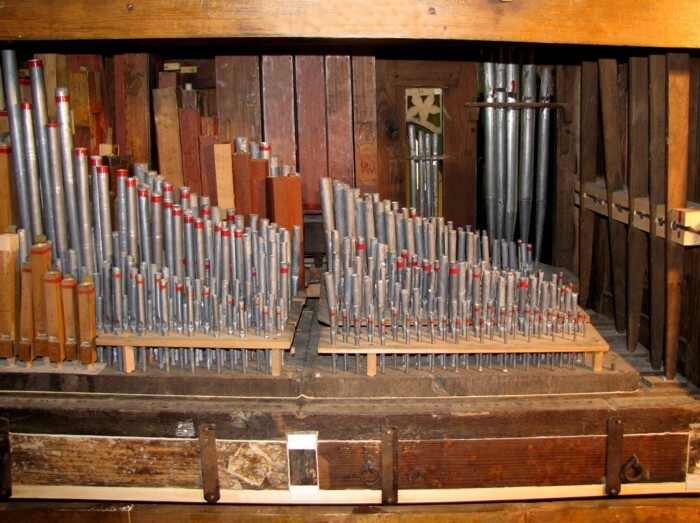 It is among the oldest organ instruments in Poland and in Europe. The discovery of the value of this instrument and its maintenance is owed to Marian Dorawa and Zdzisław Mollin’s organ building workshop. The wind chest, located just over the floor, is a unique constructional solution. The organ in the parish church in Przeczno belongs to the group of positives whose 9-register sound complex is gathered in one manual keyboard of a shortened tonal range C- c''', without the C-sharp, D-sharp, F-sharp, and G-sharp tones in the Great Octave. Dated at the end of the 17th century, it has Baroque artistic decor, centred in the front frame of a 3-tower prospectus with the omnipresent fleshy acanthus leaf ornament. 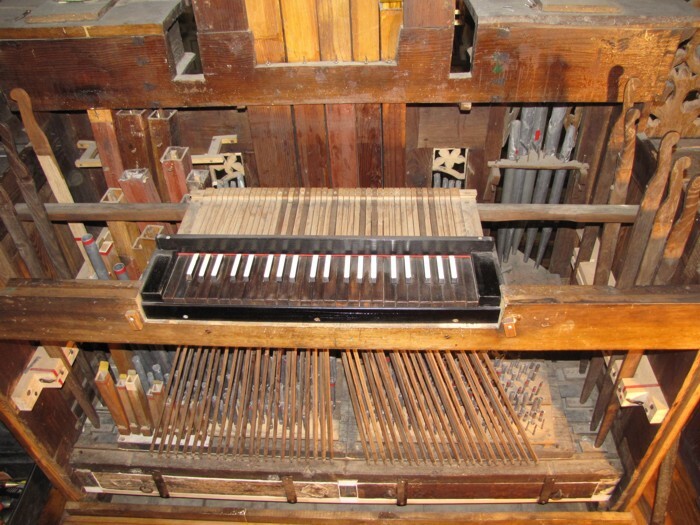 The musical instrument, located in a box housing behind it, astonishes with originality and unique layout of the elements of the equipment in the form of a mechanical slider wind chest located low above the floor, with flap valves that open from the top with the help of the so-called tappets, outgoing radiating from under the keyboard. Also the original way of turning on registers using swing hand levers adds splendour to this instrument. The coupled registers of Zimbel 1/2 F, Quinta 2/3 F and Sifflöte 1 F make the 3-choir Mixture. The unique value of this historic positive, discovered years ago by Mr. Marian Dorawa, M.A. from Toruń, and taken care of by the parish priest, Father Wacław Dokurno, PhD. and Mr. Zdzisław Mollin of Odry near Chojnice, who exercises the organ building care of the instrument, place this positive in the forefront among the most valuable objects of organ building art of the past centuries in Poland. A jewel of sounds! The principal pyramid perfectly works with the flutes creating interesting and unusual combinations of atmospheres matching with the solo voice of the soprano. The keyboard, placed in high position, allows the organist to play standing increasing the impact of his performance. 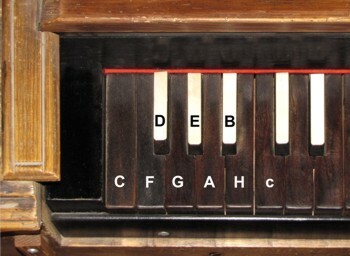 It is possible to control the noise of the keys like a real percussion set giving to each sound a new profile. I loved to shape sounds using stops and keys in unusual positions to feel the pure sound before it is locked in tempered frequencies; it was fun to add a mouth whistle – Serenata track 04 - to remind the uccelli pipe in some Italian ancient organs. Every pipe has a ghost inside, acting and singing and screaming in a transcendental world.